From the start, you will be greeted with my husband’s snow globe collection. at one time he had more than 30 snow globes. Over the years he has given each of our grandchildren one of their own. 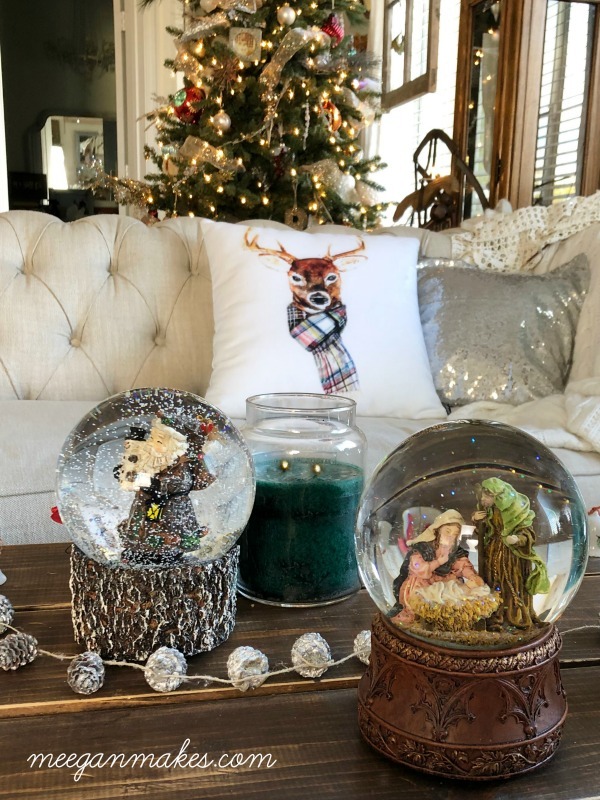 His favorite snow globes are the ones with music boxes. 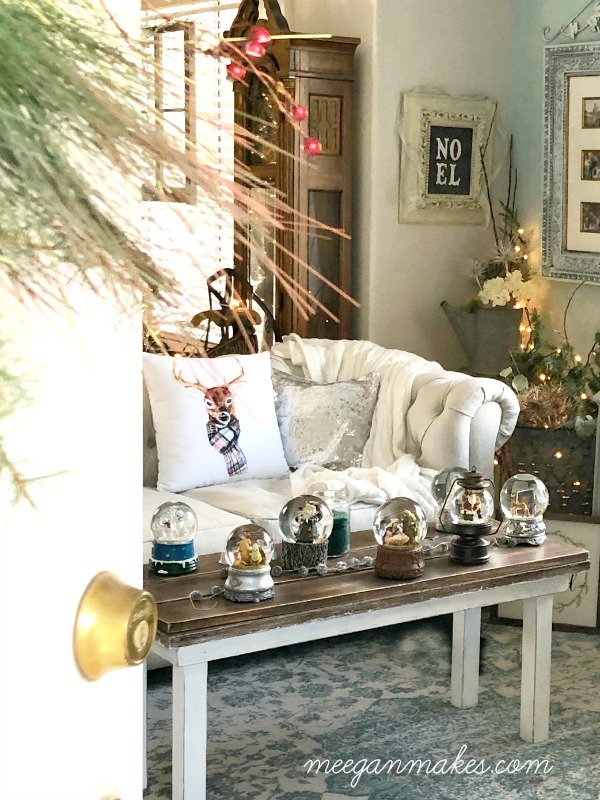 When he comes home from work, we light our Christmas tree scented candle, then wind up the snow globes, listen to the Christmas tunes and watch the snow swirl around each globe. It’s the simple things that make Christmas special, isn’t it? 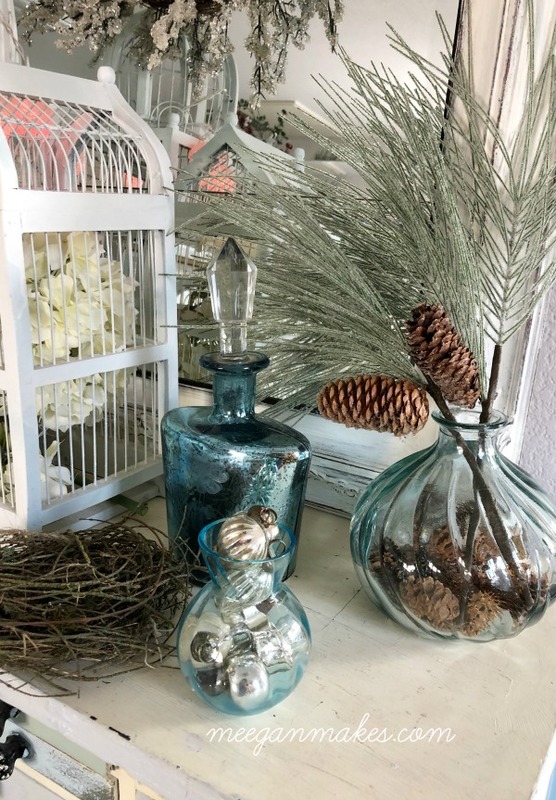 I like vintage pieces with lots of twinkle and fairy lights for our Simple Cottage Style Christmas. Using a vintage olive bucket as a base, I love to fill it with lights. I love the look of the lights shining through the slits in the bucket, don’t you? With my dried eucalyptus leaves, apple tree sticks, painted flower pods and greenery, I filled up the whole bucket. Oh, and of course, twinkle lights. 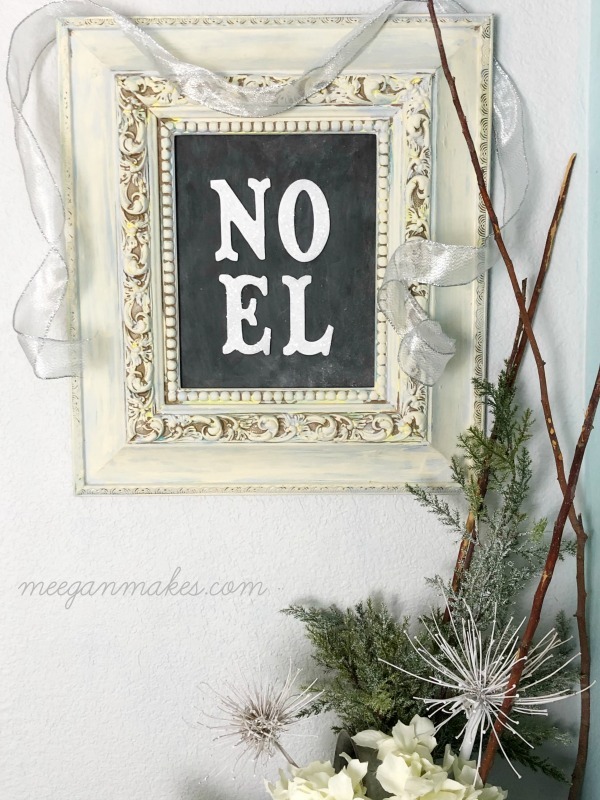 Continuing with a Simple Cottage Style Christmas, I made a chalkboard from a cereal box. (I know, kinda crazy. But would you ever guess it was a cereal box?) 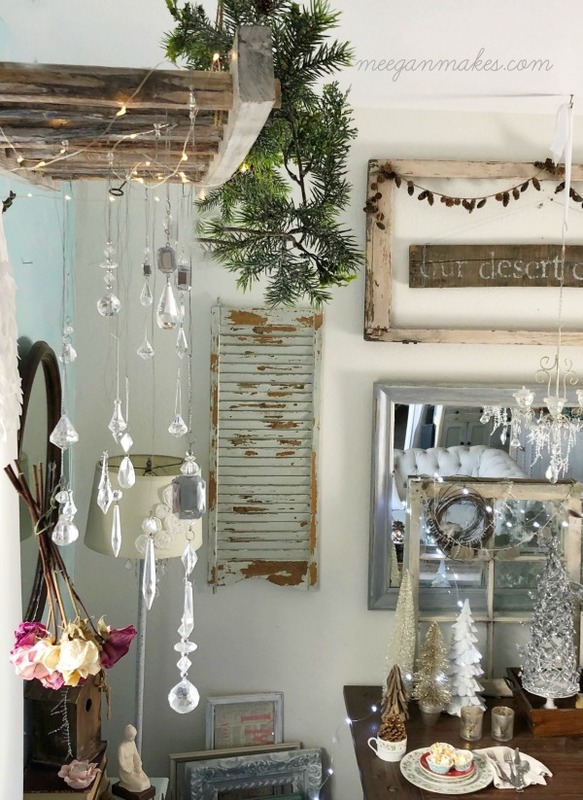 Plus, I love this rustic look. This is the view from the opposite side of our sofa. You have a small glimpse of our Christmas tree. 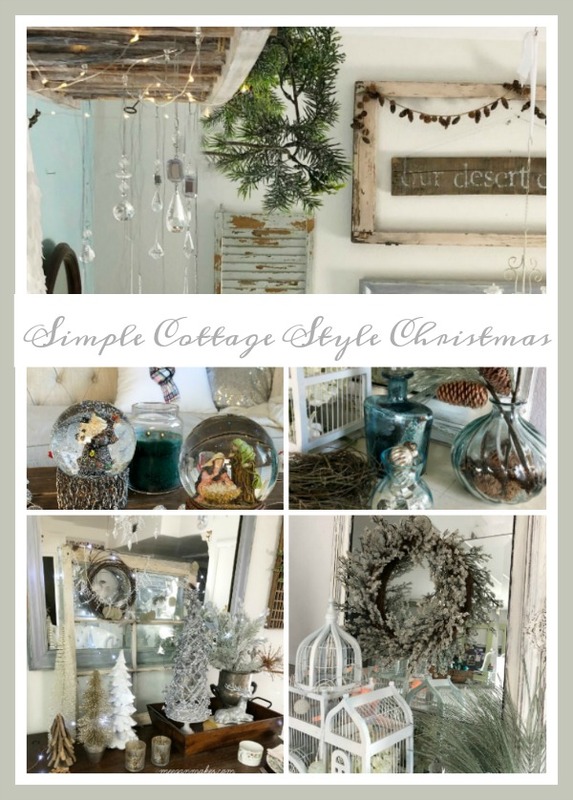 Plus a quick look at my version of Christmas Cottage Style. I opted to put our dining table in the living room to make space for the Christmas tree. I think it adds the cozy feel I was trying to create. With all the fairy lights, I am in heaven. A vintage style ladder hangs in front of the living room window. I like the crystals hanging there all year long. At Christmastime, they are just the right ambiance I like for our home. 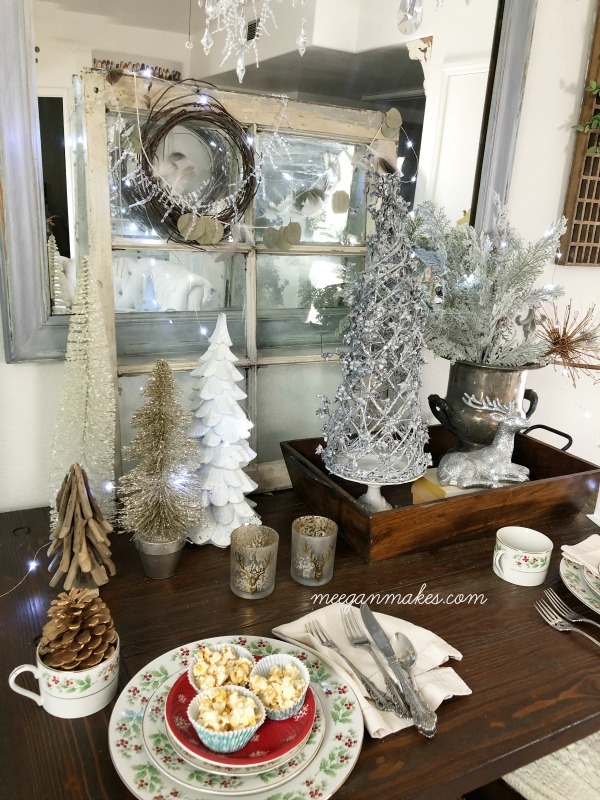 The dining table hosts a number of Christmas trees, fairy lights and some of my favorite vintage pieces. Such as, a Farmhouse window that I bought on a trip to Virginia. I found it at an actual 1800s farmhouse! Glass in tact and all the paint with it’s chippy goodness. Moving on to other side of what would be the dining area, or breakfast nook, I have a couple of my vintage furniture pieces. 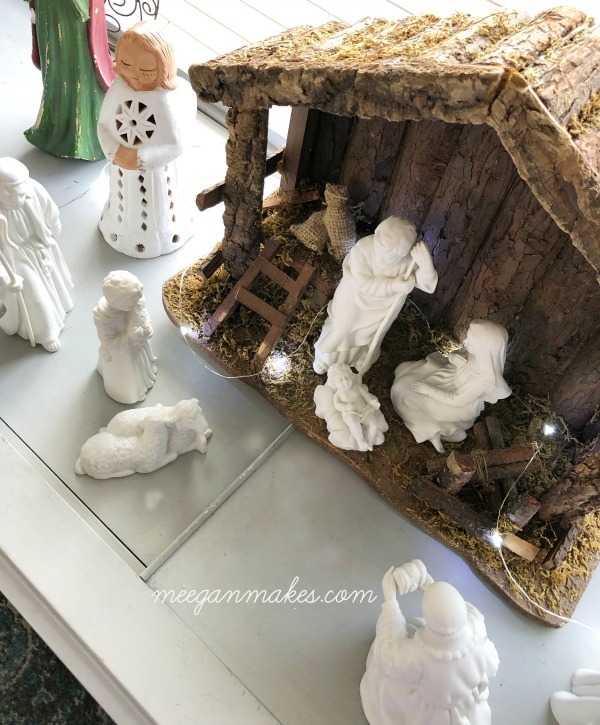 I couldn’t resist setting them up with more Simple Cottage Style Christmas pieces. 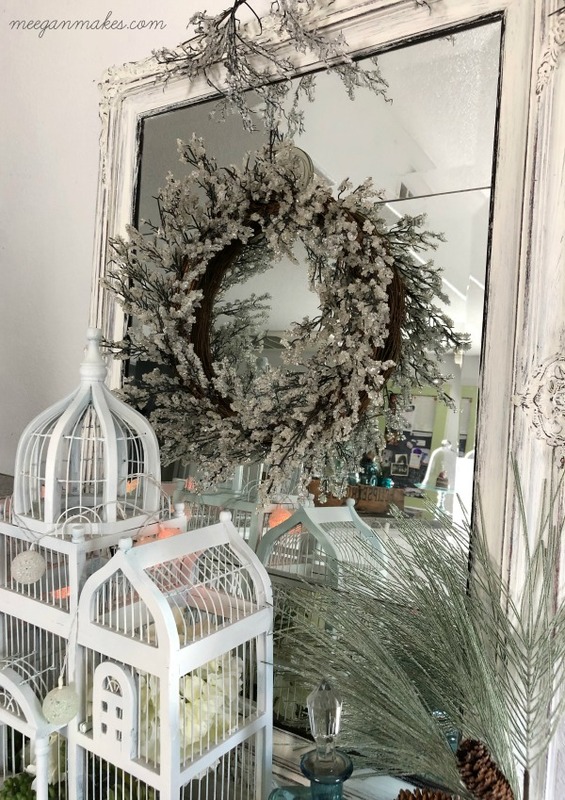 More twinkle lights adorn my vintage mirror and Victorian birdcage. I am lovin’ this icy styled wreath, as well. It just sets the tone, wouldn’t you say? I am always attracted to blue glass. Having them highlighted with Christmas makes my heart skip a beat. In the living room, on my stereo, nestled underneath the vintage ladder and crystals, is my oldest Nativity set. It was a gift from my husband, one of the first years we were married. It is set out every Christmas, without fail. Sentimental, with meaning and intention is how I like to create a Simple Cottage Style Christmas. 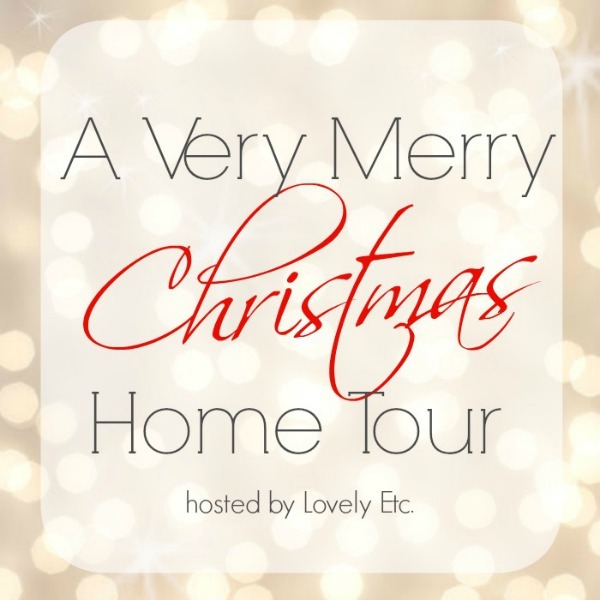 Thanks so much for joining me on this Very Merry Christmas Home Tour. I will be sharing more of my Christmas decorating within the next couple of days and weeks. I hope you will tag along with me. 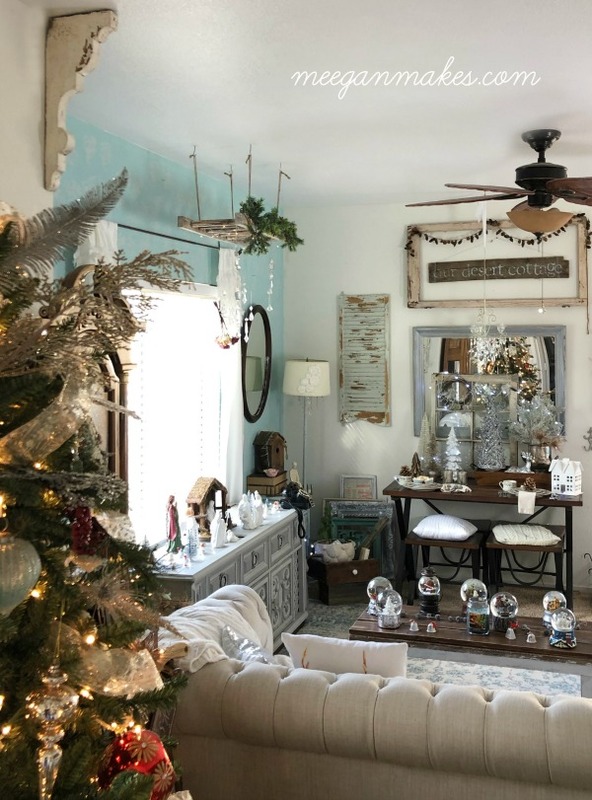 For even MORE Christmas inspiration, the next visit on the Very Merry Christmas Home Tour will be with Amber Tysl. Please tell her that I sent you. 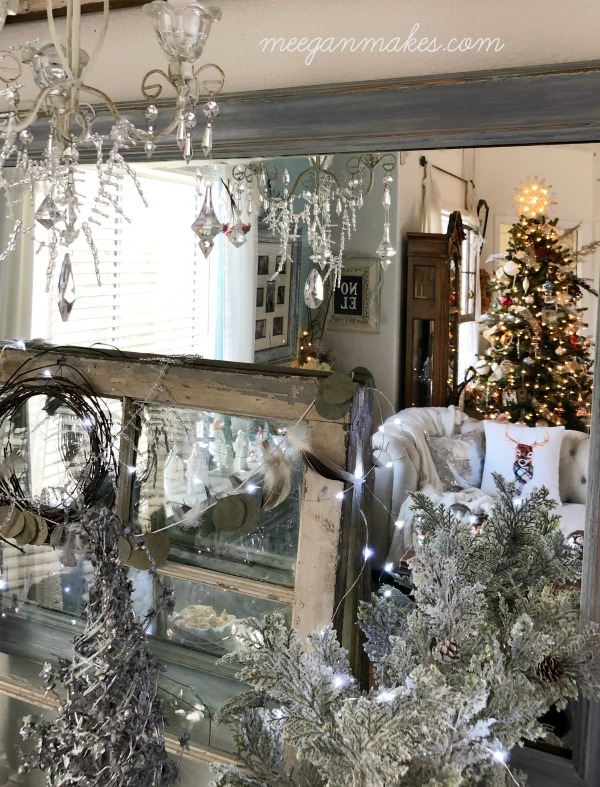 Meegan, your Christmas decor is gorgeous! I love how sparkly and twinkly everything is. And so many gorgeous vintage finds – I love it. That vintage ladder looks so amazing with those gorgeous crystals (such a fan of juxtaposition like that). Happy Holidays, Meegan! So pretty! I love how you’ve kept the sentimental items front and center. I love how collected and layered this feels! And can’t believe you made that chalkboard out of a cereal box- genius! Your cottage is looking very festive sweet friend. 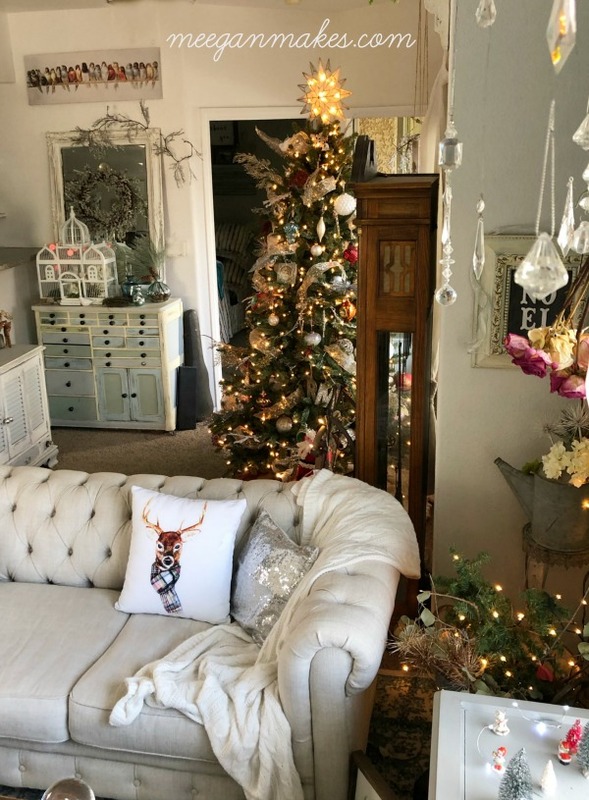 I always love all your personal, handmade and vintage pieces that combine to make a gorgeous Christmas home. Charming. I especially love that sequin pillow. I also love the way you’ve carried the same color them through out your home. Beautiful. 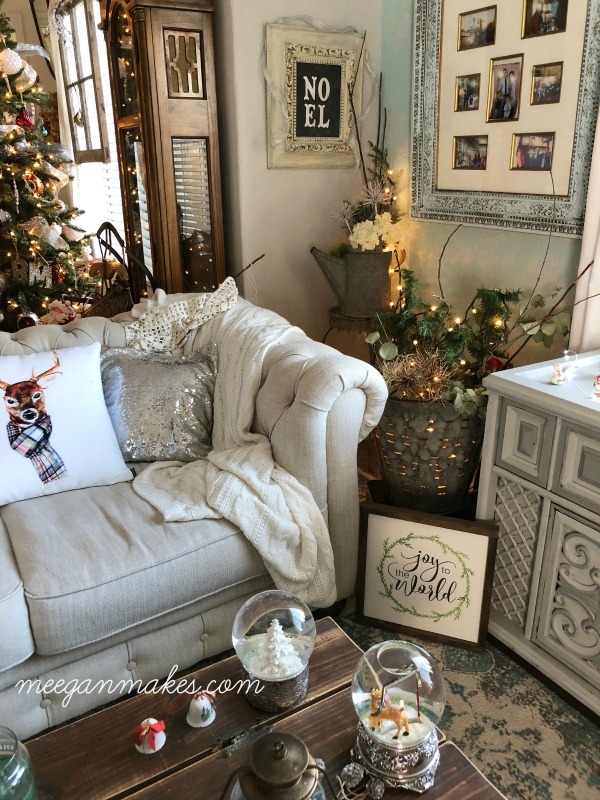 What a gorgeous home tour Meegan! I am thankful for your friendship…Merry Christmas!! Looks great! I love the snowglobe collection! And great find on the Christmas dishes!